In 2002 the Society became the first British amenity group to create a database of all its listed buildings and give every owner a customised log book. This details the house’s history, the story of Bedford Park and how to approach making changes or repairs. The Bedford Park Log Books are part of the Society’s From Knowledge Comes Care programme which was set up in dedication to the memory and tireless efforts of Thomas Affleck Greeves (1917 – 1997), the most important figure in the suburb’s history after its founder Jonathon Carr. The foundation of the Bedford Park Society in 1963 and the campaign to list its houses emanated largely from Tom Greeves and fellow enthusiast Harry Taylor, a retired builder. Although these log books belong to the house, not the owner, many are now missing. If you don’t have a log book for your property please contact us. The landscaped triangle of green outside the church hall looks as though it has always been there. In fact until 1983 Woodstock Road continued past the hall to its junction with Bath Road, leaving a rather isolated little island. Plans to close Woodstock Road, creating a pedestrian path, were drawn up by local architects Oliver West and John Scott and enthusiastically backed by the Society. The scheme went to public inquiry, but once accepted it secured funding from the David Knightly Charitable Trust. In 1994 the war memorial seat was moved to the triangle from its previous site on the corner of Bath Road opposite the Tabard. The triangle now marks the main approach to Bedford Park from the south, and the Society organises occasional working parties to supplement Hounslow Council’s maintenance programme. 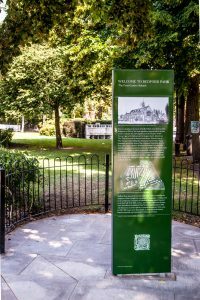 Some 30 years later, in 2014, the triangle acquired another landmark – a modern information sign introducing the visitor to the historical, architectural and social importance of Bedford Park. This project was masterminded by our president, Nigel Woolner, and vice chairman Peter Murray. Some residents had initial misgivings about the very modern metal and ceramic design, which is a customised version of the Legible London signs seen all over the capital. However, with local architect John Scott’s help on design and planning, the end result received a big round of applause when it was finally unveiled. The Society started its green plaque scheme in 1988 to commemorate important former residents. The first plaque went up on the Blenheim Road house where the Yeats family, including poet William Butler Yeats, lived. Other plaques celebrate VSO founder Alec Dickson, who also lived in Blenheim Road, and the Newton Grove home of Tom Greeves. The last one was fixed to the wall of the Rusthall Avenue house where committee stalwart Beryl Brownsword, who led the Society’s planning team for many years, lived for most of her life.